But I am used to using oxygen bottles! Bottles may be the low cost option for short distances. But an oxygen concentrator provides valuable options. Unlimited and continuous O2 supply: OXYFLY is an oxygen generator for aircraft that automatically adjusts the oxygen ﬂow rate depending on the altitude. 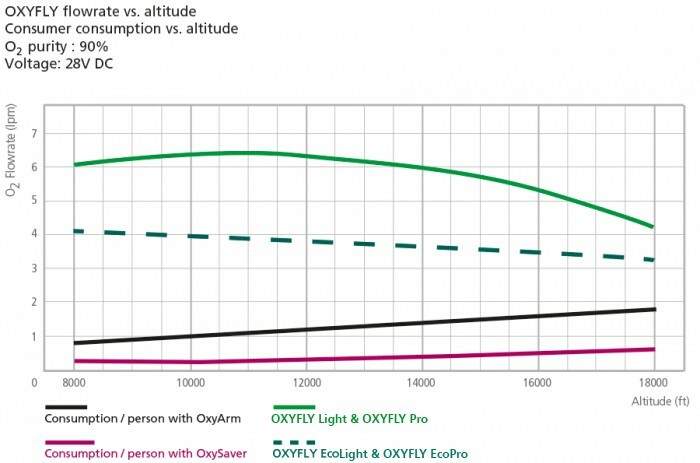 OXYFLY serves you as long as your aircraft has power. No waste of money for procurement, reﬁll and maintenance of O2 bottles. The liberty to ﬂy where you want without the limitation of having aviation oxygen at the airport. Pre-heated oxygen for increased user comfort. No danger of chemical or high compressed oxygen in tanks. Eliminate the hassle of oxgen management once and for all. No more purchasing, reﬁlling, storing, calculating or even running out. Our On Board Oxygen Generation System (OBOGS) OXYFLY is an innovative technical improvement. The flow rate of oxygen at 18.000 ft is still sufficient to provide 2 to 6 people, depending on the cannula.